When you want to compare the parts of something to the whole, you can use a pie graph. 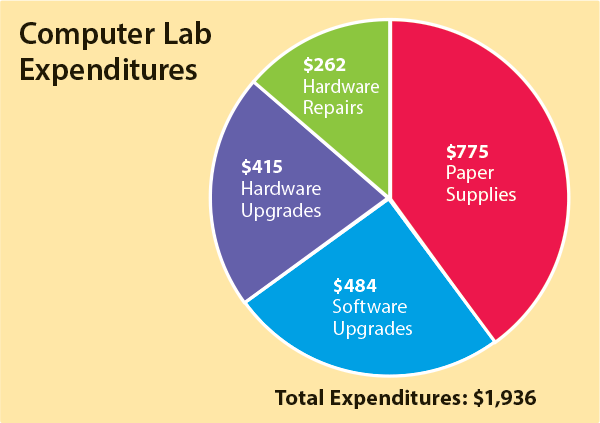 This pie graph shows the amount of money that a school spent in one year on its computer lab. The total amount was $1,936, and the greatest cost was paper supplies. Your Turn Create a pie graph by hand. Divide the number for each favorite pet type by the total number of students and multiply by 100 to get a percentage. Round anything after the decimal. Multiply each favorite pet percentage by 3.6 to get the number of degrees. Draw a line from the top of the circle to the center. Set a protractor on the line and measure to the right the number of degrees for the largest group. Make a second line to mark the pie slice. Set the protractor on this line and measure and mark the next largest pie slice. Keep going from largest to smallest pie slice until you have completed the circle. Label each pie slice with the pet type and percentage. Give your pie graph a descriptive title. Your Turn Create a pie graph by using a spreadsheet. Copy the data from the table above into a spreadsheet program, such as Google Sheets. Compare your digital pie graph with your handmade one. How similar are they? Creating Pie Graphs by Thoughtful Learning is licensed under a Creative Commons Attribution-NonCommercial-ShareAlike 4.0 International License. Based on a work at k12.thoughtfullearning.com/minilesson/creating-pie-graphs.